Most prominent and historical Shiva temples are located throughout Andhra Pradesh especially in Krishna and Guntur districts. People from all over India visit these temples especially in Maha Sivaratri and festive times. In this article, I am giving out the details and importance of these temples located in Krishna and Guntur districts of A.P. along with mythological importance related to these places in Part-I. Shiva is a Hindu deity worshiped by large population of India. As Shiva is one of the three main Gods of Hindu religion he has so many temples through out India. Many important and most popular Shiva temples are located in Andhra Pradesh and out of which some ancient famous Shiva temples are found in Krishna and Guntur districts of this state. Each of these temples have some mythological importance connected to them by which they became so famous. Here I am providing an account of some ancient historical temples of this Krishna and Guntur districts. This temple is located 13 kilometers south- west of Narsaraopet of Guntur district. It is 35 Km. away from Guntur city and can travel to here by buses. 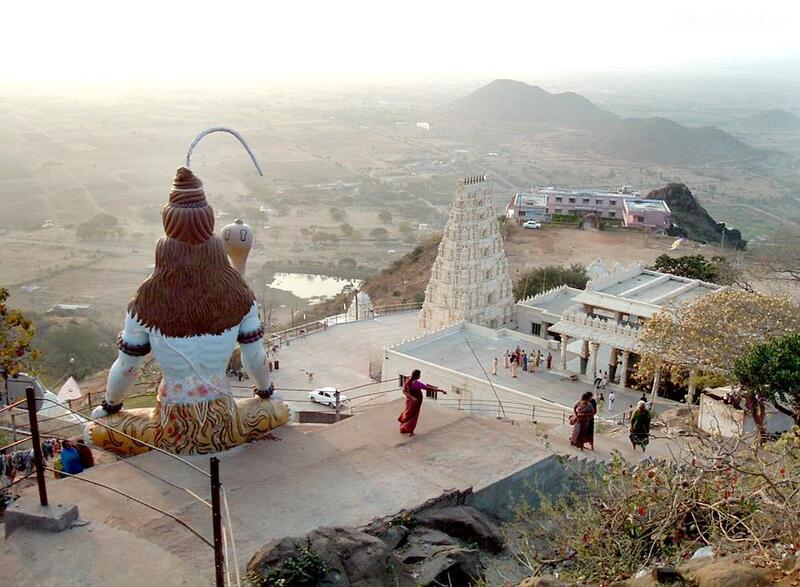 Lord Shiva reside here as 'Medha Dakshinamurty' on the top of Kotappakonda (hill) which is 1587 feet high. To reach the shrine above the hill one has to climb stairway of 1000 steps. The three peeked Kotappakonda hill is popularly known as Trikutachalam or Trikutadri. The three peaks of the hill can be seen very easily from any distance or direction of the hill. The three peaks were named after the Hindu Triumurti Brahma Sikharam, Vishnu Sikharam and Maheswara Sikharam. The diety found in the form of Shivalingam on the hill top of this sacred place is known as Trikuteswara or Trikoteswara. Infront of the temple on hill top there are eight sacred ponds and lakes are present. The temple is having an holy pond known as 'Papanashana Teertha'. The temple is known to be existed even well before 1172 AD according to the King Velanati Choda inscriptions. King Sree Krishna Devaraya aided in the development of this temple through his gifts and donation of lands. On the way top top to the Trikoota hill through steps we can see the dieties of Lord Ganesh, Shiva, Brahma, Maha Vishnu, Maha Lakshmi, Maha Kali, Maha Saraswathi. According to legendary puranas, after 'Daksha Yagna' Lord Shiva transformed into a 12 year old boy and started to perform a penance on Trikoota hill. Brahma, Devatas and Maharishi's prayed Medha Dakshinamurthy to reveal the knowledge of 'Brahma'. Then Medha Dakshinamurty agreed to this and called them to appear before him on Trikoota hill. So this is the place where Lord Shiva imparted 'Brahma gyanam' to all and thus this place became so sacred. People believe that visiting Medha Dakshinamurty on this Trikkoota hill will help them to get blessed with great eternal knowledge. No marriages will be held in this temple as Medha Dakshinamurty observed celibacy here on this sacred hill. One more interesting thing about this temple is one never find a Crow on the top of the hill where the Lord Shiva shrine exists. There is a legendary mythological reason associated with it. Once upon a time, an ardent devotee of Lord Shiva used to live below the Trikoota hill. She used to climb the hill to the top and used to carry milk for abhishekam to Lord Shiva daily. Once as she was climbing the hill with milk pot in her hand, a Crow disturbed and spoiled the milk. On seeing this she became angry and cursed the Crows saying that they cannot reach the temple site on top of the hill. Thus the reason why we may find Crows below the hill only but never find a Crow at the premises of the temple on the top of the hill. Maha Shivarathri festival will be celebrated with great pomp and fervor on top of the hill. Lakhs of people visit this temple on this festival from throughout India. This historical Lord Shiva temple is located 35 Km. away from Guntur City of A.P. One can reach the temple from Guntur city by bus within 40 minutes. For every 10 minutes there is a bus for this place from Guntur city. 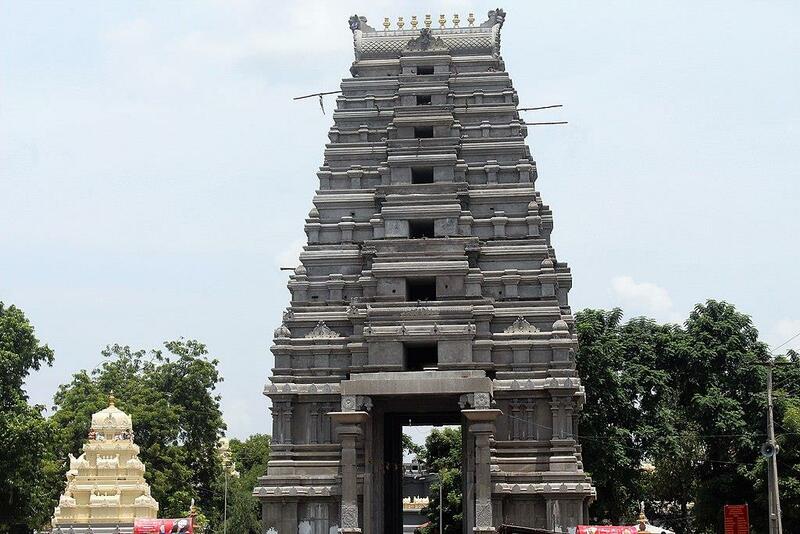 Amareswara temple is one of the first five 'Pancharama Kshetra' located in Amaravati town of Guntur district, A.P. The Shivalinga at this place is known to be established by Lord Indra. The Shivalinga located in this temple is very tall. To conduct abhishekam Archaka's stand on a raised platform in this temple. As the Shivalinga continues to grow in this temple, to stop its growth it is believed a nail was dug at the top of the Shivalinga in the past. A stain of blood can be seen on the top linga even today. According to legendary puranas, when Devatas and Danavas while churning the Ocean of milk Amruta lingam came out and that was stolen by the demon king Tarakasura. 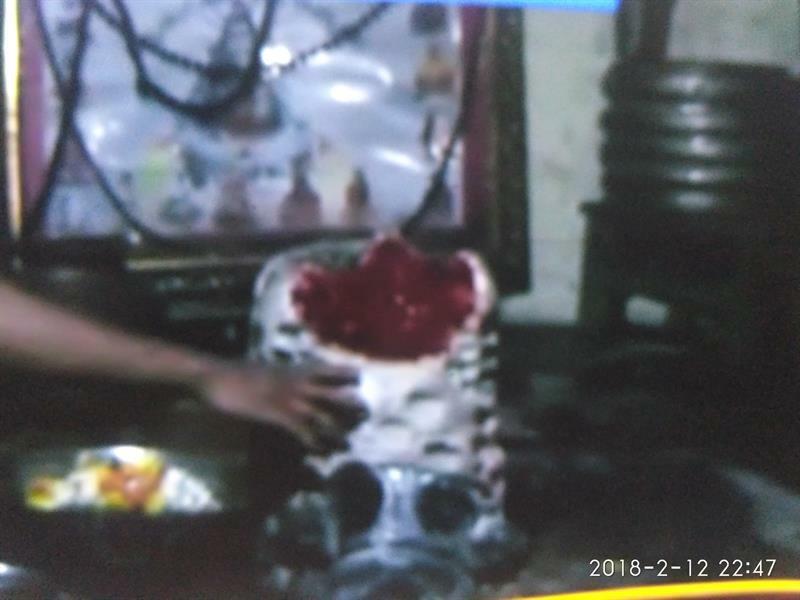 He stored this Amrut lingam in his neck. With the help of the magical powers of that Amrut linga he started harassing Devatas. When they prayed Lord Shiva to protect them from him, Lord Shiva sent his son Kumara Swamy to fight with Tarakasura. When Kumaraswamy tored Tarakasura neck, the Amrut lingam was split into five bits and was fallen at five places. One of this first piece was fallen in Amaravati and thus this Kshetram is known Amaralingeswaralayam. Amereswaralayam of Amaravati is known to be constructed in 18th century by Sri Raja Vasi Reddy Manne Sultan. During Shivarathri time lakhs of people from throughout India visit this temple. This temple is an ancient 1000 years old temple located in Pedakakani of Guntur district of Andhra Pradesh. This temple is located 10 Km. away from Guntur city on Guntur-Vijayawada high way. Sri Bramarambha Malleswara Swamy temple was established by Sri Adi Shankaracharya. Later the same temple is visited and renovated by the king Sri Krishna Devaraya. This temple is very famous for Rahu-Ketu Puja. Sri Malleswara Swamy temple is one of the Jyotirlingam of Srisailam temple. 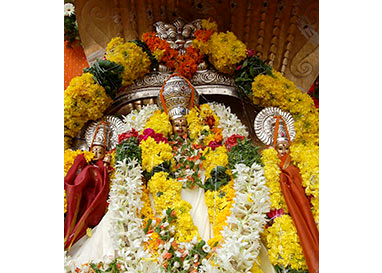 The Goddess Bramarambha Devi is one of the Astadasa Sakthi. So worshiping Sri Malleswara Swamy deity is equal to worshiping Sri Bramarambha Malleswara Swamy of Srisailam. According mythological Puranas, Sri Bharadwajasa Maharishi during his visit to all Teerthas he visited this temple. He wished to perform a Yagnam in this place. He invited all Maharishis and celebrated the Yagnam. During the distribution of Havisses after completion of the ceremony, a Crow started to have this Havisses. Sri Bharadwajasa Maharishi got disappointed because he has to donate this Havisses to Yagna Purushas. The Crow than told that he was a King Kakasura and by Tapassu he got boon from Brahma that he can have that Havissu which is intended for Devathas. He asked Bharadwajasa Maharishi to provide Panchamrutha abhishekam. By this the Crow changed into White color and started worshiping the deity with Jasmine flowers and thus the deity got its name 'Sri Bramarambha Malleswara Swamy temple'. As the Crow got its Mokha in this place, this place from then onwards is popularly known as 'Kakani'. In 11 th Century there is an ancient Sri Someswara temple at Amrutuluru Mandal of Guntur district. But as the temple was got slowly ruined, people of Govada raised a fund to renovate the ruined Sri Someswara temple into beautiful Sri Balakoteswara Swamy temple in 1904. In this temple Mahasivarathri festival will be celebrated for five days on a grand scale. Thousands of people from all over the state will visit this temple on this festive season. This temple is situated 45 Km. away from Guntur district. Good bus connectivity is there for this temple from Guntur, Tenali Ponnur and Repalle. 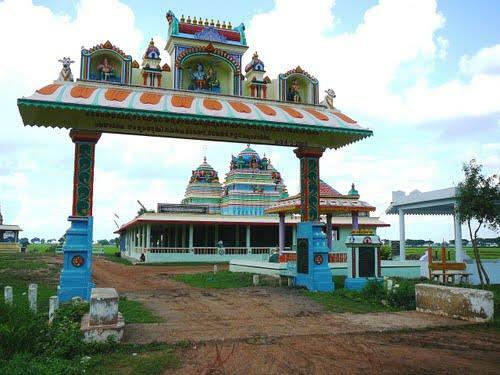 This is one of the most famous and historical temple of Lord Shiva located in Chejerla Village of Guntur district. It is one of the oldest temple constructed in 4th Century. Nine inscriptions were there in the temple itself which says that there are 4,444 Shivalinga's are there around Kopoteswara Swamy temple. Inscriptions of 1069 B.C., 1087 B.C. and also the inscriptions of Vijayanagara Kingdom were there in this temple. This temple is 28 Km. away from Narsaraopet town of Guntur district. According to mythological puranas, King Sibi has two brothers-Meghadambar and Jeemuthavahan. Meghadambar with the consent of his brother went to a hill top of Kashmir along with Yogi's to Tapassu. After long time of Tapassu he died and transformed into a linga rupa. To find out where about of his brother, Jeemuthavahana went to the same place and did the same Tapassu and transformed into linga rupa like his brother. Then King Sibi to find out his two sons, he went to that place and realized the fate of his sons. Then he decided to perform 100 Yagas to satisfy Lord Shiva. After completing 99 Yagas and he is carrying out the 100th Yaga, Trimuthy's want to test his qualities of Dharma and sacrifice. Shiva in the form of hunter, Brahma in the form of bow and Pigeon in the form of Vishnu came to king Sibi. First Pigeon came to him and asked Sibi to protect him from the hunter. Sibi promised the Pigeon, at any cost he will save his life. Then the hunter came and told King Sibi that by promising to save the life of Pigeon he is taking away the opportunity to earn his food by hunting which makes him die. To overcome from this tussle of Dharma, King Sibi wants to cut a part of his body's flesh which is equivalent to the weight of Pigeon. But how much flesh he cut from his body it did not make equal to the weight of Pigeon. Finally he cut his own head to equate the weight of Pigeon. Lord Shiva stunned at the great qualities of Dharma and sacrifice of King Sibi and requested him to ask any boons he wants from him. Then King Sibi asked moksha for him and his companions and also they have to remain as Shivalingas for ever on this earth. The deity Kapoteswara here in this temple can be seen in Lingakara, the top of the linga head cut off. There are two large cavities in the Linga which denotes the flesh cut from the body of King Sibi. The cavities in the linga absorb abhisheka Tirdha and no one knows where this Tirdha flows.